It's common to find artworks relating addictions with zombies. Here is a homemade sign of English heritage. A zombie (Haitian French: zombi, Haitian Creole: zonbi) is a fictional undead being created through the reanimation of a human corpse. Zombies are most commonly found in horror and fantasy genre works. The term comes from Haitian folklore, where a zombie is a dead body reanimated through various methods, most commonly magic. Modern depictions of zombies do not necessarily involve magic but often invoke science fictional methods such as radiation, mental diseases, viruses, scientific accidents, etc. A new version of the zombie, distinct from that described in Haitian folklore, has also emerged in popular culture in recent decades. This "zombie" is taken largely from George A. Romero's seminal film Night of the Living Dead, which was in turn partly inspired by Richard Matheson's 1954 novel I Am Legend. 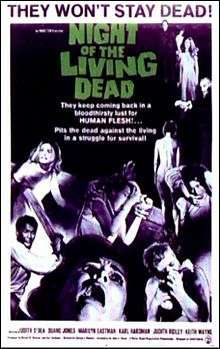 The word zombie is not used in Night of the Living Dead, but was applied later by fans. The monsters in the film and its sequels, such as Dawn of the Dead and Day of the Dead, as well as its many inspired works, such as Return of the Living Dead and Zombi 2, are usually hungry for human flesh, although Return of the Living Dead introduced the popular concept of zombies eating brains. The "zombie apocalypse" concept, in which the civilized world is brought low by a global zombie infestation, became a staple of modern popular art. The English word "zombie" is first recorded in 1819, in a history of Brazil by the poet Robert Southey, in the form of "zombi", actually referring to the Afro-Brazilian rebel leader named Zumbi and the etymology of his name in "nzambi". The Oxford English Dictionary gives the origin of the word as West African, and compares it to the Kongo words "nzambi" (god) and "zumbi" (fetish). The Haitian tradition also includes an incorporeal type of zombie, the "zombie astral", which is a part of the human soul. A bokor can capture a zombie astral to enhance his spiritual power. A zombie astral can also be sealed inside a specially decorated bottle by a bokor and sold to a client to bring luck, healing or business success. It is believed that God eventually will reclaim the zombie's soul, so the zombie is a temporary spiritual entity. It has been suggested that the two types of zombie reflect soul dualism, a belief of Haitian voodoo. Each type of legendary zombie is therefore missing one half of its soul (the flesh or the spirit). The zombie belief has its roots in traditions brought to Haiti by enslaved Africans, and their subsequent experiences in the New World. It was thought that the voodoo deity Baron Samedi would gather them from their grave to bring them to a heavenly afterlife in Africa ("Guinea"), unless they had offended him in some way, in which case they would be forever a slave after death, as a zombie. A zombie could also be saved by feeding them salt. 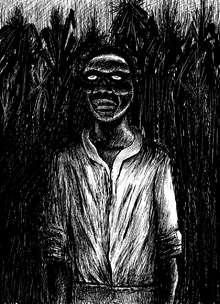 A number of scholars have pointed out the significance of the zombie figure as a metaphor for the history of slavery in Haiti. Pulliam and Fonseca (2014) and Walz (2006) trace the zombie lineage back to the Epic of Gilgamesh. Davis traveled to Haiti in 1982 and, as a result of his investigations, claimed that a living person can be turned into a zombie by two special powders being introduced into the blood stream (usually via a wound). The first, coup de poudre (French: "powder strike"), includes tetrodotoxin (TTX), a powerful and frequently fatal neurotoxin found in the flesh of the pufferfish (order Tetraodontidae). The second powder consists of deliriant drugs such as datura. Together, these powders were said to induce a deathlike state in which the will of the victim would be entirely subjected to that of the bokor. Davis also popularized the story of Clairvius Narcisse, who was claimed to have succumbed to this practice. The most ethically questioned and least scientifically explored ingredient of the powders, is part of a recently buried child's brain. Roland Littlewood, professor of anthropology and psychiatry, published a study supporting a social explanation of the zombie phenomenon in the medical journal The Lancet in 1997. The turn of the millennium coincided with a decade of box-office successes in which the zombie subgenre experienced a resurgence: the Resident Evil movies (2002, 2004, 2007, 2010, 2012), the British films 28 Days Later and 28 Weeks Later (2002, 2007), the Dawn of the Dead remake and the comedy/pastiche Shaun of the Dead (both 2004). The new interest allowed Romero to create the fourth entry in his zombie series: Land of the Dead, released in the summer of 2005. Romero returned to the series with the films Diary of the Dead (2008) and Survival of the Dead (2010). 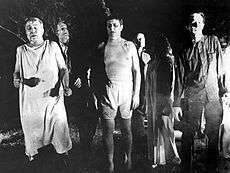 Generally, the zombies in these shows are the slow, lumbering and unintelligent kind first made popular in Night of the Living Dead. Motion pictures created within the 2000s, however, like the Dawn of the Dead remake, and House of the Dead, have featured zombies that are more agile, vicious, intelligent, and stronger than the traditional zombie. An alternate take on the zombie was 2013's film (and book) Warm Bodies, where the zombie has consciousness and some intelligence. In 2013, the AMC series The Walking Dead had the highest audience ratings in the United States for any show on broadcast or cable with an average of 5.6 million viewers in the 18- to 49-year-old demographic. Due to a large number of thematic films and video games, the idea of a zombie apocalypse has entered the mainstream, and many fans have begun making efforts to prepare for the hypothetical future zombie apocalypse. Such efforts include creating weapons and selling educational material informing people how to survive a zombie outbreak; while most of these are tongue-in-cheek and do not represent an authentic belief that a zombie apocalypse in the near future is likely, the Centers for Disease Control and Prevention (CDC) have used the fictional scenario to demonstrate survival and emergency-preparedness techniques that may be useful in a "real-world" setting. Zombies are a popular theme for video games, particularly of, but not limited to, the stealth, survival horror, first-person shooter and role-playing game genres. Important horror fiction media franchises in this area include Resident Evil, Dead Rising, House of the Dead, Dead Island, Left 4 Dead, Dying Light, State of Decay, The Last of Us and the Zombies game modes from Call of Duty title series. DayZ, a zombie-based survival horror mod for ArmA 2, was responsible for over 300,000 unit sales of its parent game within two months of its release. Outside of video games, zombies frequently appear in trading card games, such as Magic: The Gathering or Yu-Gi-Oh! Trading Card Game (which even has a Zombie-Type for its "monsters"), as well as in role-playing games, such as Dungeons & Dragons, tabletop games such as Zombies!!! and Dead of Winter: A Cross Roads Game, and tabletop wargames, such as Warhammer Fantasy and 40K. The game Humans vs. Zombies is a zombie-themed live-action game played on college campuses. A variation of the zombie walk is the zombie run. Here participants do a 5k run wearing a belt with several flag "lives". If the chasing zombies capture all of the flags the runner becomes "infected". If he or she reaches the finish line--which may involve wide detours--ahead of the zombies the participant is a "survivor". In either case an appropriate participation medal is awarded. Ophiocordyceps unilateralis a fungus that creates so-called "zombie ants"
1 2 3 4 5 6 Maçek III, J.C. (15 June 2012). "The Zombification Family Tree: Legacy of the Living Dead". PopMatters. ↑ Deborah Christie, Sarah Juliet Lauro, ed. (2011). Better Off Dead: The Evolution of the Zombie as Post-Human. Fordham Univ Press. p. 169. ISBN 978-0-8232-3447-9. 1 2 "Zombie", in Oxford English Dictionary Online (subscription required), accessed 23 May 2014. The quotation cited is: "Zombi, the title whereby he [chief of Brazilian natives] was called, is the name for the Deity, in the Angolan tongue." ↑ "Books: Mumble-Jumble". TIME. 1940-09-09. Retrieved 2013-11-05. ↑ Deborah Christie, Sarah Juliet Lauro, ed. (2011). Better Off Dead: The Evolution of the Zombie as Post-Human. Fordham Univ Press. p. 169. ISBN 0-8232-3447-9, 9780823234479. ↑ Stokes, Jasie. "Ghouls, Hell and Transcendence: The Zombie in Popular Culture from "Night of the Living Dead" to "Shaun of the Dead"". Brigham Young University. Retrieved 2016-02-03. ↑ Savage, Annaliza (15 June 2010). "'Godfather of the Dead' George A. Romero Talks Zombies". Wired. Retrieved 2 October 2011. ↑ "Zombie". Oxford English Dictionary. Oxford University Press. 1998. ↑ "J'irai loler sur vos tombes - Romero". 11min 15sec. 2011-09-23. ↑ Wilentz, Amy (2012-10-26). "A Zombie Is a Slave Forever". The New York Times. Haiti. Retrieved 31 October 2012. ↑ "The Relacion of Fray Ramon Pane". ↑ Whitehead, Neal L. (2011). Of Cannibals and Kings: Primal Anthropology in the Americas. Penn State Press. pp. 39–41. ↑ Edmonds, Ennis B.; Gonzalez, Michelle A. (2010). Caribbean Religious History: An Introduction. NYU Press. p. 111. ↑ Seabrook, William (1929). The Magic Island. Blue Ribbon Books. p. 103. ↑ Mars, Louis P. (1945). "Media life zombies for the world". Man. 45 (22): 38–40. doi:10.2307/2792947. JSTOR 2792947. ↑ Moreman, Christopher M.; Rushton, Cory James (2011). Race, Oppression and the Zombie: Essays on Cross-Cultural Appropriations of the Caribbean Tradi. McFarland. p. 3. ISBN 978-0-7864-5911-7. ↑ Moore, Brian L. (1995). Cultural Power, Resistance, and Pluralism: Colonial Guyana, 1838-1900. University of California Press. pp. 147–149. ↑ Dayan, Joan (1998). Haiti, History, and the Gods. University of California Press. p. 37. ↑ Marinovich, Greg; Silva Joao (2000). The Bang-Bang Club Snapshots from a Hidden War. William Heinemann. p. 84. ISBN 0-434-00733-1. ↑ Marinovich, Greg; Silva Joao (2000). The Bang-Bang Club Snapshots from a Hidden War. William Heinemann. p. 98. ISBN 0-434-00733-1. 1 2 Niehaus, Isak (June 2005). "Witches and Zombies of the South African Lowveld: Discourse, Accusations and Subjective Reality". The Journal of the Royal Anthropological Institute. 11 (2): 197–198. doi:10.1111/j.1467-9655.2005.00232.x. ↑ Pulliam, June Michele; Fonseca, Anthony J. (2014-06-19). Encyclopedia of the Zombie: The Walking Dead in Popular Culture and Myth: The Walking Dead in Popular Culture and Myth. ABC-CLIO. pp. 113–. ISBN 9781440803895. Retrieved 10 May 2015. ↑ Bishop, Kyle William (2010-01-26). American Zombie Gothic: The Rise and Fall (and Rise) of the Walking Dead in Popular Culture. McFarland. pp. 41–. ISBN 9780786455546. Retrieved 10 May 2015. ↑ "When Zombies Attack!". UGO.com. 2008-06-24. Retrieved 2013-11-05. ↑ "Miskatonic University library - H.P. Lovecraft in the Comics". Yankeeclassic.com. Retrieved 2013-11-05. ↑ Clasen, Mathias (2010). "Vampire Apocalypse: A Biocultural Critique of Richard Matheson's I Am Legend". Philosophy and Literature. ↑ Biodrowski, Steve. 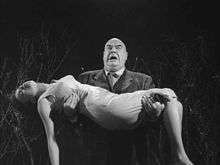 "Night of the Living Dead: The classic film that launched the modern zombie genre"
↑ Davis, Wade (1983), The Ethnobiology of the Haitian Zombie, Journal of Ethnopharmacology, 9: 85-104. ↑ Davis, Wade (1988), Passage of Darkness: The Ethnobiology of the Haitian Zombie, University of North Carolina Press, pp 115-116. ↑ Booth, W. (1988), "Voodoo Science", Science, 240: 274–277. ↑ Oswald, Hans Peter (2009). Vodoo. BoD – Books on Demand. p. 39. ISBN 3-8370-5904-9. ↑ Littlewood, Roland; Chavannes Douyon (11 October 1997). "Clinical findings in three cases of zombification". The Lancet. 350 (9084): 1094–1096. doi:10.1016/s0140-6736(97)04449-8. Retrieved 28 March 2014. ↑ Dein, Simon (January 2006). "Interview with Roland Littlewood on 5th December 2005" (PDF). World Cultural Psychiatry Research Review. 1 (1): 57–59. ↑ Littlewood, Roland (1 December 1997). "The plight of the living dead". Times Higher Education. Retrieved 28 March 2014. ↑ "White Zombie (1932) Review". ↑ "Zombies, Malls, and the Consumerism Debate: George Romero's Dawn of the Dead". ↑ "IMDb: Most Popular "Zombie" Feature Films Released In 2014". IMDb. ↑ "The Zombie Movie Encyclopedia, Volume 2: 2000-2010". ↑ Pulliam, June (2006). "The Zombie". In Joshi, S. T. Icons of Horror and the Supernatural. Greenwood Press. ISBN 0313337802. ↑ Twitchell, James B. (1985). Dreadful Pleasures: An Anatomy of Modern Horror. Oxford: Oxford University Press. ISBN 0195035666. ↑ Roger Ebert, review of Night of the Living Dead, Chicago Sun-Times, January 5, 1969, at RogerEbert.com; last accessed July 8, 2014. ↑ "Zombies". GreenCine. Retrieved 2013-11-05. ↑ "Re-Animator". Rotten Tomatoes. Retrieved 2013-11-05. 1 2 3 4 Balmain 2006, p. 113. ↑ Balmain 2006, p. 115. ↑ Kermode, Mark (6 May 2007). "A capital place for panic attacks". London: Guardian News and Media Limited. Retrieved 12 May 2007. ↑ "Stylus Magazine's Top 10 Zombie Films of All Time". ↑ Cronin, Brian (3 December 2008). "John Seavey's Storytelling Engines: George Romero's "Dead" Films". Comic Book Resources. Retrieved 4 December 2008. ↑ Levin, Josh (2007-12-19). "How did movie zombies get so fast?". Slate.com. Retrieved 2013-11-05. ↑ Levin, Josh (24 March 2004). "Dead Run". Slate. Retrieved 4 December 2008. ↑ Luckhurst, Roger (2015). Zombies: A Cultural History. Reaktion Books. ISBN 9781780235646. ↑ Chandni Doulatramani (9 May 2013). "Walking Dead breathes life into AMC results". Reuters. Retrieved 19 May 2013. 1 2 Paffenroth, Kim (2006). Gospel of the Living Dead: George Romero's Visions of Hell on Earth. Waco: Baylor University Press. ISBN 1932792651. ↑ Rockoff, Adam (2002). Going to Pieces: The Rise and Fall of the Slasher Film, 1978–1986. Jefferson, NC: McFarland. p. 35. ISBN 0-7864-1227-5. ↑ Clute, John; Grant, John, eds. (1999). "Zombie Movies". The Encyclopedia of Fantasy. New York: St. Martin's Press. p. 1048. ISBN 0-312-19869-8. ↑ Cripps, Charlotte (1 November 2006). "Preview: Max Brooks' Festival of the (Living) Dead! Barbican, London". The Independent. Retrieved 19 September 2008. ↑ McAlister, Elizabeth (2012-01-01). "Slaves, Cannibals, and Infected Hyper-Whites: The Race and Religion of Zombies". Anthropological Quarterly. 85 (2): 457–486. doi:10.1353/anq.2012.0021. ISSN 1534-1518. ↑ Harrison, Michael (5 December 2008). "10 Geeky Gifts for Under $10". Wired. Retrieved 13 February 2011. ↑ Cohen, Paddy (13 February 2016). "Zombie Costumes". Retrieved 13 February 2016. 1 2 3 Kenreck, Todd (17 November 2008). "Surviving a zombie apocalypse: 'Left 4 Dead' writer talks about breathing life into zombie genre". Video game review. msnbc. Retrieved 3 December 2008. ↑ Daily, Patrick. "Max Brooks". Chicago Reader. Archived from the original on 21 December 2008. Retrieved 28 October 2008. ↑ Jason Thompson (9 January 2014). "House of 1000 Manga - 10 Great Zombie Manga". Anime News Network. Retrieved 11 January 2014. ↑ Kino, Carol (30 July 2006). "Jillian Mcdonald, Performance Artist, Forsakes Billy Bob Thornton for Zombies". New York Times. Retrieved 6 May 2009. ↑ "CERAP - Centre d'Etudes et de Recherches en Arts Plastiques". Cerap.univ-paris1.fr. 1 December 1994. Retrieved 7 July 2012. ↑ Christopher T. Fong (2 December 2008). "Playing Games: Left 4 Dead". Video game review. Retrieved 3 December 2008. ↑ "Urbandead.com". Surcentro.com. Retrieved 2013-11-05. ↑ Usher, William (1 July 2012). "DayZ Helps Arma 2 Rack Up More Than 300,000 In Sales". Cinema Blend. Retrieved 2012-07-03. ↑ Nutt, Christian (January 23, 2015). "DayZ hits 3 million sales after 13 months in Early Access". Gamasutra. UBM plc. Retrieved January 24, 2015. ↑ Wexler, Laura. "Commando Performance". The Washington Post. Retrieved 20 April 2010. 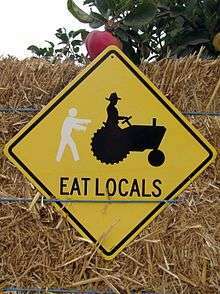 1 2 "Preparedness 101: Zombie Apocalypse". Bt.cdc.gov. 16 May 2011. Retrieved 6 April 2012. ↑ "Preparedness 101 : Zombie Pandemic" (PDF). Cdc.gov. Archived from the original (PDF) on 19 October 2013. Retrieved 2013-11-05. 1 2 Morris, Casey. "How To Weather the Zombie Apocalypse". Weather.com. Retrieved 27 February 2012. ↑ Eaton, Kit (11 May 2010). "Zombie Blood Quenches Thirst, Boosts Energy, Turns Consumers Into Brain-dead Horde". Fast Company. Fast Company. Retrieved 18 November 2010. 1 2 Mogk, Matt (2011-09-13). Everything You Ever Wanted to Know About Zombies. Gallery Books. pp. 214–. ISBN 9781451641578. ↑ Hombach, Jean-Pierre. Michael Jackson King of PoP. epubli. pp. 126–. ↑ Dendle, Peter (2012). Zombie Movie Encyclopedia: 2000-2010. McFarland. pp. 256–. ISBN 9780786492886. Retrieved 19 May 2013. 1 2 3 Craig Wilson, "Zombies lurch into popular culture via books, plays, more," USA Today, 9 April 2009, p. 1D (1st page of Life section, above the fold), found at Zombies lurch into popular culture article at USA Today. Retrieved 13 April 2009. ↑ Colley, Jenna. "Zombies haunt San Diego streets". signonsandiego.com. Retrieved 1 October 2009. ↑ Kemble, Gary. "They came, they saw, they lurched". Australia: ABC. Retrieved 1 October 2009. ↑ Dalgetty, Greg. "The Dead Walk". Penny Blood magazine. Archived from the original on 6 September 2009. Retrieved 1 October 2009. ↑ Horgen, Tom. "Nightlife: 'Dead' ahead". StarTribune.com. Retrieved 1 October 2009. ↑ Dudiak, Zandy. "Guinness certifies record for second annual Zombie Walk". yourpenntrafford.com. Retrieved 1 October 2009. ↑ Chodorow, Adam (2013). "Death and Taxes and Zombies". Iowa Law Review. 98: 1207. ↑ "Zombies on the Brain". The Chronicle of Higher Education. Balmain, Colette (2008). Introduction to Japanese Horror Film. Edinburgh University Press. ISBN 1903254418.